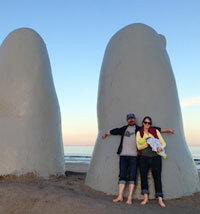 For members of the UCMP community, summer is not a time for vacationing at the beach. It’s the ideal time to further one’s research: attend meetings, do field work, visit museum collections, collaborate with colleagues, and/or write. Jean Alupay spent a week at the Marine Biological Laboratory in Woods Hole, MA, establishing collaborations with neuroscientists and physiologists to study the effects of autotomy on octopus behavior and electrophysiology. In July, she joined Lindsey Dougherty, Carole Hickman, Jenna Judge and David Lindberg in the Azores for the World Congress of Malacology. 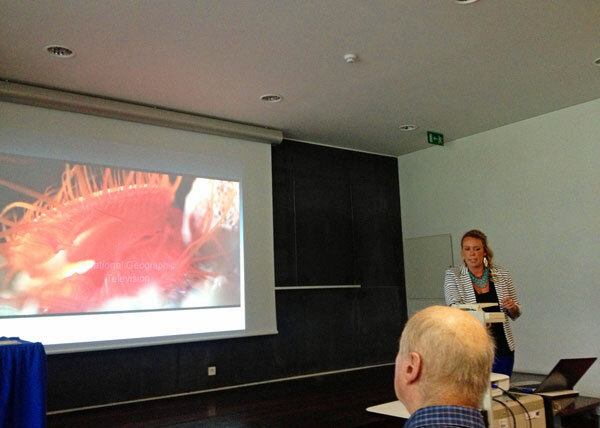 Jean gave a talk entitled “Arm autotomy in octopus Abdopus aculeatus on Mactan Island, Philippines.” Lindsey gave a presentation on her optical, microscopy and particle-modeling work with the disco clams. 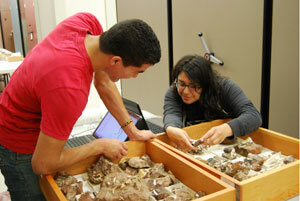 Clockwise from top: Students Bogart Marquez and Sandy Gutierrez working on the Pleistocene South Africa collection. 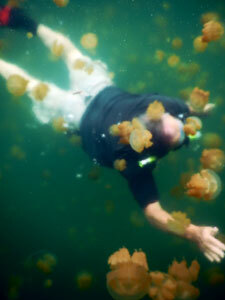 Jere Lipps swimming among the jellyfish of Jellyfish Lake, Palau. 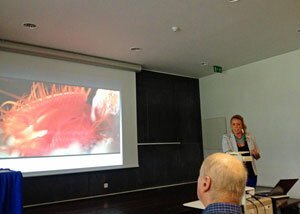 Lindsey Dougherty presenting at the World Congress of Malacology meeting in the Azores. Tony Barnosky finished writing his new book on how solutions to the sixth mass extinction lie in feasible adjustments to how we generate power, grow food, and make money. The book will be published by UC Press in 2014. 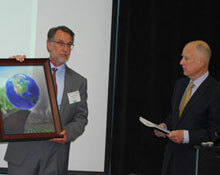 Tony also continues to work with the California Office of the Governor to promote science-based solutions to global change problems. With 15 other global change scientists he developed the scientific consensus statement “Maintaining Humanity’s Life Support Systems in the 21st Century,” which has now found its way into a number of state, national, and international discussions about environmental solutions. Tony also traveled to Belfast, Northern Ireland, to present a paper on causes of South American megafauna extinctions (coauthored by Emily Lindsey, Natalia Villavicencio, and Charles Marshall) at the 11th International Mammalogical Congress. The NSF-funded research is a collaboration involving some 20 other investigators from ten countries. Bill Clemens returned to northeastern Montana where he reconnected with current and former UCMP colleagues, including Greg Wilson, UCMP alum now on the faculty at the University of Washington, and Nan Arens, former UCMP Curator now at the Hobart and William Smith Colleges in New York. With Greg, Bill continued to collect fossil vertebrates and new data to document patterns of faunal change across the Cretaceous/Paleogene boundary. Greg brought a group of students from UW and then taught a field school for high school science teachers. Nan continued her studies of the paleobotanical record and collected sediment samples for analysis of their stable isotopes. Also in northeastern Montana, Paul Renne, director of the Berkeley Geochronology Center, and his graduate students, Courtney Sprain and Jessica Banaszak, were very successful in finding layers of volcanic ash that could yield extremely precise radiometric age determinations. These, closely correlated with the fossil record, will add to the precision of studies of the tempo of faunal and floral change during deposition of the Hell Creek and Tullock Formations. 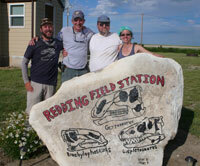 Don Lofgren, another UCMP alum, directed the group to sites in his doctoral research area. Dori Contreras spent part of her summer in Truth or Consequences, NM, conducting her first season of field work for her dissertation. 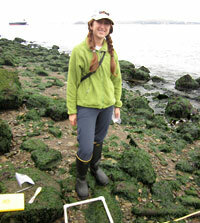 With her assistants, Meriel Melendrez and undergraduate Nicolas Locatelli, they collected an impressive load (~1 ton!) of fossil plants from a volcanic ash bed more than a kilometer long. By studying the diversity and distribution of plants from this assemblage, Dori will be able to shed some light on the community structure of Cretaceous floras in warm, wet climates. After concluding her field work, Dori headed to San José, Costa Rica, to give a presentation at the joint meeting of the Association of Tropical Biology and Conservation (ATBC) and the Organization for Tropical Studies (OTS). Then it was on to New Orleans and the BOTANY 2013 conference where she was joined by Jeff Benca, Ivo Duijnstee, Winnie Hsiung, Cindy Looy, Meriel Melendrez, Stephanie Ranks and Robert Stevenson. Dori, Jeff, Meriel, Stephanie and Robert all walked away with awards (see Tidbits)! Lindsey Dougherty spent her summer doing underwater field work on Lizard Island in Australia, Bali, the Indonesian islands of Raja Ampat, and in the Lembeh Strait. The Australian Museum in Sydney allowed Lindsey to examine their Ctenoides ales (the so-called disco clam) collection, which included the holotype. Liz Ferrer traveled to the Florida Museum of Natural History, the Smithsonian, the Australian Museum, and the Western Australian Museum in order to photograph specimens. In between trips, she co-hosted the annual Geometric Morphometrics Workshop, July 29 - August 2, in the Integrative Biology Department. 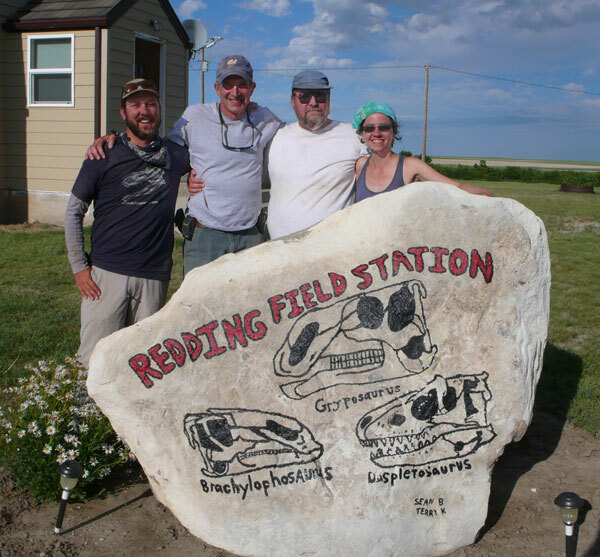 Mark Goodwin spent three weeks in Montana this summer, starting on the farm of Dan and Lila Redding, longtime supporters of UCMP field research and Montana paleontology, where a Museum of the Rockies (MOR) field crew was already hard at work. Mark confirmed UCMP localities in the area and how they, and more recent localities found by the MOR group, tie in to the local stratigraphy. 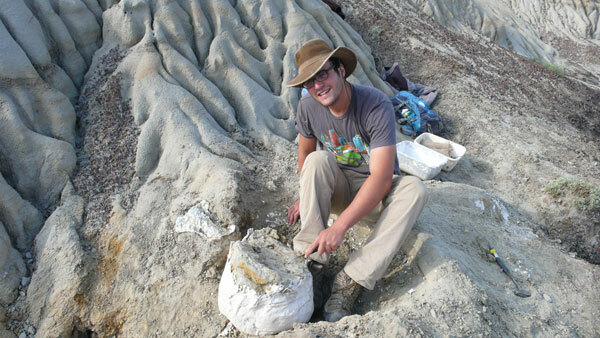 Mark’s son Graham, a member of the MOR field crew, found a well-preserved hadrosaur jaw while prospecting with his Dad. Later in July, Mark presented results from his current research on fossil baleen at the Second International Symposium on Paleohistology, held at the MOR. Mark then headed east to Carter County, Montana, to check out Burpee Museum dinosaur sites and local exposures of the Hell Creek Formation. Mark, and other paleontologists working in the Ekalaka area, gave public presentations on their work at the Carter County Museum’s “Dino Shindig;” Mark’s presentation was on pachycephalosaurs. Clockwise from top: Whitney Reiner in Olduvai Gorge; Emily Lindsey with husband and new baby; Graham Goodwin (Mark's son, in Montana; Carole Hickman with Sally Walker, Cheryl Longinotti and Doris Sloan; Lindsey Dougherty scuba diving; Mark Goodwin at the 'Redding Field Station' in Montana. 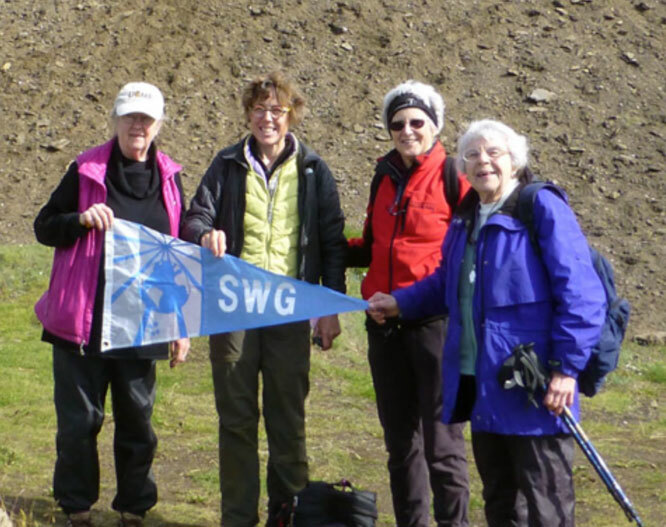 Carole Hickman led an expedition to the remote Tjörnes seacliff shell beds in northern Iceland, carrying the flag of the Society of Woman Geographers. Expedition participants included UCMP Curatorial Associate Dr. Doris Sloan, Professor Sally Walker (University of Georgia, UCMP Ph.D. 1975), and volunteers Ellen Barth, Cheryl Longinotti, and Laura Stockton. The expedition obtained detailed photographic documentation of field settings and stratigraphic horizons matching UCMP collections. This summer, Jenny Hofmeister spent another three months at the USC Wrigley Institute for Environmental Sciences on Catalina Island. She counted and collected octopuses, their predators, and their prey in her further efforts to understand what ecological factors dictate octopus distribution and abundance in the wild. 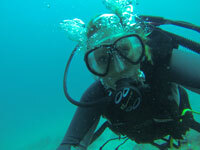 She also helped with the outreach and education programs on the island. David Lindberg traveled to Northern Ireland and visited the Queen’s University Marine Laboratory in Portaferry where he studied the local limpet fauna. 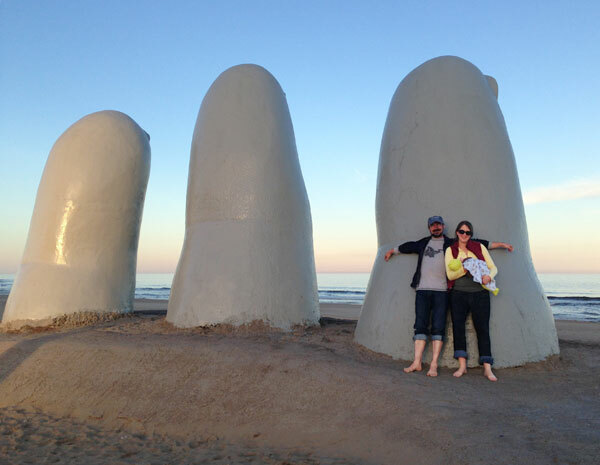 Emily Lindsey had a baby (Christopher Darwin Lindsey Tomasz) and moved to Uruguay to start a Fulbright grant researching late-Quaternary extinctions in South America. After 19 years, Jere Lipps returned to Palau to study forams and the taphonomy of soft-bodied organisms in the marine lakes formed in Miocene raised reefs of the Rock Islands. With Michael Dawson of UC Merced, Jere returned to the famous Jellyfish Lake to recollect sites published by Jere and former post-doc Martin Langer in 1999. Several members of the Looy Lab drove to Albuquerque, NM, for a conference on the Carboniferous-Permian transition that was organized by the New Mexico Museum of Natural History and Science. While there, Jeff Benca, Ivo Duijnstee, Renske Kirchholtes, Cindy Looy and Robert Stevenson did some fossil collecting at late Carboniferous and early Permian plant fossil localities in the Albuquerque vicinity. 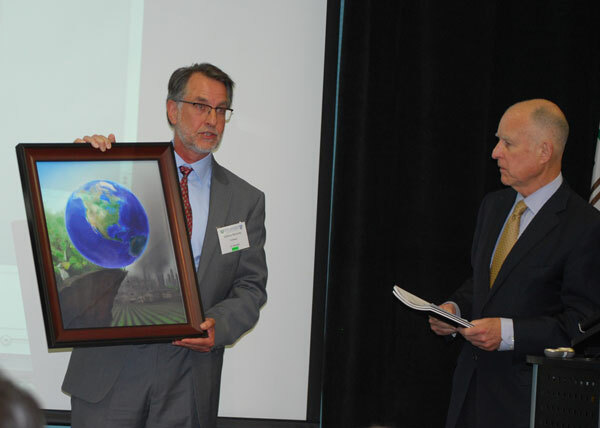 In June, Cindy and Ivo returned to Washington, DC, where Cindy attended a biannual workshop on assembly and disassembly of ecosystems organized by the Evolution of Terrestrial Ecosystem program of the Smithsonian’s National Museum of Natural History. 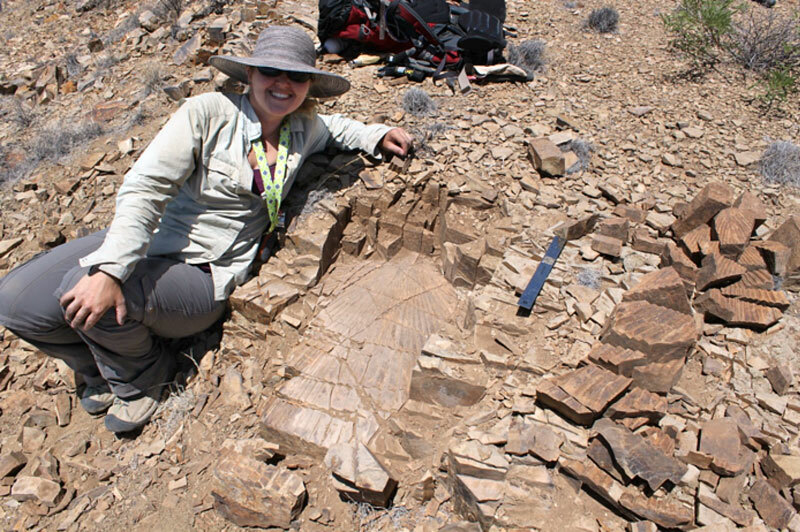 Cindy compiled existing data sets on Paleozoic plant fossils for the workshop while Ivo photographed Permian conifers as a precursor of future data sets. 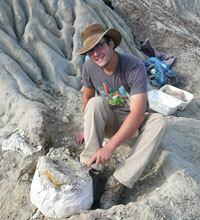 Tesla Monson worked with Hlusko Lab undergraduates in the ongoing Pleistocene South Africa Summer Curatorial Project. The group spent the summer curating and cataloging UCMP’s South African fossils. The undergraduates involved in the project are Bogart Marquez, Sandy Gutierrez, Marianne Brasil, Kevin Roth and Risa Takenaka. Their analysis of these and other fossils is contributing to individual research projects. Bogart and Sandy both presented their research at Berkeley’s Biology Scholars Program symposium in July and will present posters at the SACNAS (Society for the Advancement of Chicanos and Native Americans in Science) conference in October. Marianne and Kevin are working on honors theses using the UCMP collections and Tesla will be presenting her research at the American Association of Physical Anthropologists conference in April 2014. Members of the UCMP had another successful season in the Triassic at Ghost Ranch, NM. UCMP Curator Kevin Padian, former grad student Randy Irmis (a professor at the University of Utah), former undergrad student Sterling Nesbitt (a professor at Virginia Tech), current undergrads Sarah Tulga and Ben Kligman, and a rotating cast of participants from other institutions worked the various levels of the Hayden Quarry for the eighth consecutive year. Some excellent specimens were recovered. 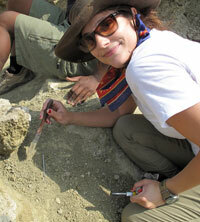 Whitney Reiner joined the Olduvai Vertebrate Paleontology Project (OVPP) for a second field season. Co-directed by her advisor Leslea Hlusko, she kept busy collecting vertebrate fossils in Olduvai Gorge, located in northern Tanzania. Rosemary Romero spent her summer at the Darling Marine Center in Maine and at Friday Harbor Labs on San Juan Island, WA, taking courses in algal culturing techniques and Marine Phycology. 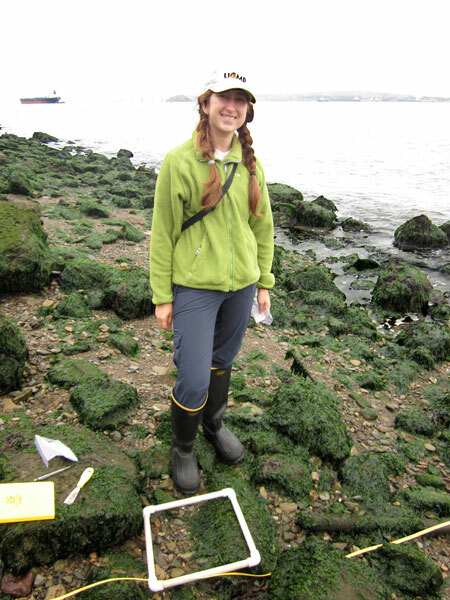 Rosemary also worked with Cindy Looy on a project timing the origin of kelps and began an experiment at the Romberg Tiburon Center that tests the effects of herbivores on recruitment of “green tide”-forming algae. 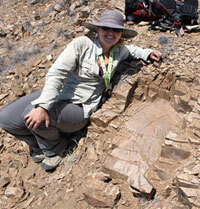 Allison Stegner spent April–May excavating Holocene fossils near Canyonlands, Utah. After breaking her foot in the field, she had plenty of time over the summer to pick fossils out of the sediment she recovered. 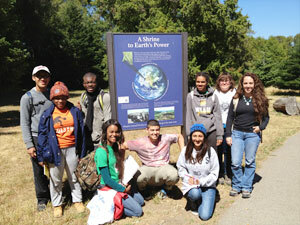 As part of the METALS (Minority Education Through Traveling and Learning in the Sciences) program, Lisa White, with faculty and graduate students from San Francisco State University, University of Texas El Paso, and University of New Orleans, led 30 high school students from the Bay Area, El Paso, and New Orleans on a California geology field trip. Starting at Pt. 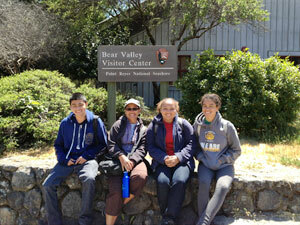 Reyes National Seashore and concluding at Yosemite National Park, the trip was supported by an NSF collaborative grant. METALS (Minority Education Through Traveling and Learning in the Sciences) seeks to increase the number and diversity of students choosing academic paths in the Earth Sciences by exposing them to the geosciences in field settings.